This species is accepted, and its native range is NE. & E. Tropical Africa, Arabian Peninsula. Annual; culms 20–90 cm. high, erect. Leaf-blades flat, up to 30 cm. long and 4 mm. wide. Panicle lanceolate to broadly ovate, 10–40 cm. long, diffuse or contracted, with slender pedicels and long flexuous branches of which the lowest form a whorl, the axils hairy or glabrous. Spikelets 4–12-flowered, narrowly oblong, 5.5–9 mm. long, 1.5–2 mm. wide, straw-coloured to dark green or reddish, the florets at first appressed to the rhachilla, but diverging as the grain swells, remaining intact at maturity; glumes lanceolate, acuminate, unequal, the lower 1.2–2.5 mm. long and 0–1-nerved, the upper 1.7–3 mm. ; lemmas oblong-elliptic, 2–2.7 mm. long, acute; palea scaberulous on the keels, eventually falling very tardily with the lemma; anthers 3, 0.3–0.6 mm. long. Caryopsis oblong, 1–1.2 mm. long, turgid, white or reddish brown. Annual. Culms erect; 20-90 cm long. Ligule a fringe of hairs. Leaf-blades 10-30 cm long; 2-4 mm wide. Inflorescence a panicle. Panicle open, or contracted; lanceolate, or ovate; 10-40 cm long. Primary panicle branches whorled at lower nodes. Panicle branches flexuous; glabrous in axils, or bearded in axils. Spikelets solitary. Fertile spikelets pedicelled. Pedicels filiform. Spikelets comprising 4-12 fertile florets; with diminished florets at the apex. Spikelets oblong; laterally compressed; 5.5-9 mm long; 1.5-2 mm wide; persistent on plant. 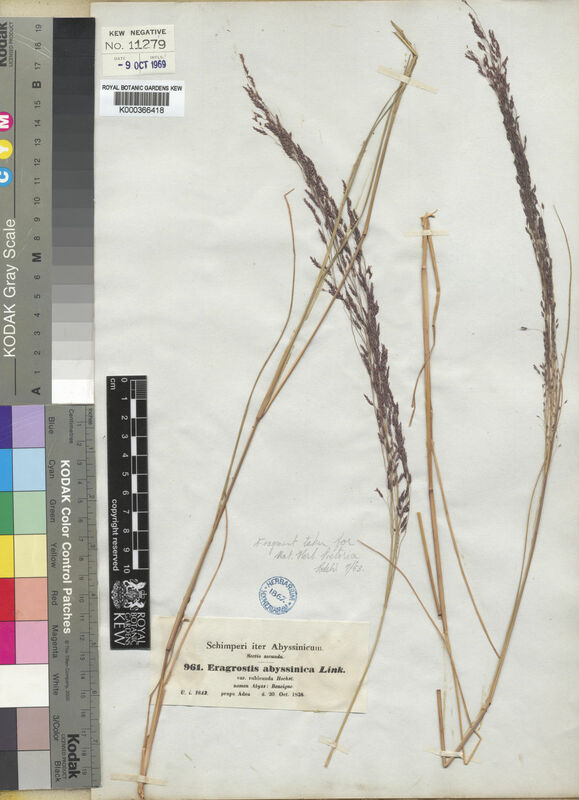 Glumes similar; shorter than spikelet. Lower glume lanceolate; 1.2-2.5 mm long; 0.7-0.8 length of upper glume; 1-keeled; 0-1 -veined. Lower glume lateral veins absent. Lower glume apex acuminate. Upper glume lanceolate; 1.7-3 mm long; 0.8-1.1 length of adjacent fertile lemma; 1-keeled; 1 -veined. Upper glume lateral veins absent. Upper glume apex acuminate. Fertile florets appressed to rhachilla, or divergent (at maturity). Fertile lemma elliptic, or oblong; 2-2.7 mm long; membranous; keeled; 3 -veined. Lemma apex acute. Palea keels scaberulous. Apical sterile florets resembling fertile though underdeveloped. Anthers 3; 0.1-0.6 mm long. Caryopsis with adherent pericarp; oblong; isodiametric; exposed between gaping lemma and palea at maturity; 1-1.2 mm long; pallid, or dark brown, or red. Europe: central and eastern. Africa: north, northeast tropical, east tropical, southern tropical, south, and western Indian ocean. Asia-temperate: Arabia. Asia-tropical: India and Malesia. Australasia: Australia. Pacific: southwestern. South America: southern South America. Loosely caespitose annual; culms up to 90 cm tall, usually erect, branched or unbranched, glabrous at the nodes, eglandular; leaf sheaths glabrous; ligule a line of hairs; leaf laminas 6–30 cm × 2–4 mm, linear, flat or involute, glabrous, eglandular. Panicle 10–40 cm long, lanceolate to broadly ovate, diffuse or contracted, the spikelets evenly distributed on slender flexuous pedicels 4–9 mm long, the lowermost primary branches in a whorl, the remainder not so, terminating in a fertile spikelet, glabrous or thinly long-pilose in the axils, slender and flexuous, eglandular. Spikelets 5.5–9 × 1.5–2 mm, narrowly oblong, lightly laterally compressed, 4–12-flowered, the florets remaining intact for some time on the persistent rhachilla, very tardily deciduous; glumes unequal, reaching to about the middle of the adjacent lemmas, keeled, lanceolate in profile, glabrous, subacute to acute or acuminate at the apex, the inferior 1.2–2.5 mm long, the superior 1.7–3 mm long; lemmas 2–2.7 mm long, keeled, oblong-elliptic to oblong-ovate in profile, thinly membranous with distinct lateral nerves, at first appressed to the rhachilla and those in opposite rows with overlapping margins concealing the rhachilla, later diverging and exposing the rhachilla as the caryopsis swells, straw-coloured to dark green or reddish, glabrous, subacute to acute at the apex; palea very tardily deciduous with the lemma, glabrous on the flanks, the keels slender, wingless, scaberulous; anthers 3, 0.3–0.6 mm long. Caryopsis 1–1.2 mm long, oblong, turgid, white or reddish-brown, usually retained on the mature panicle. D.M. Napper, Grasses of Tanganyika: 31(1965). K.W. Harker & D.M. Napper, An Illustrated Guide to the Grasses of Uganda p. 30(1960). A.V. 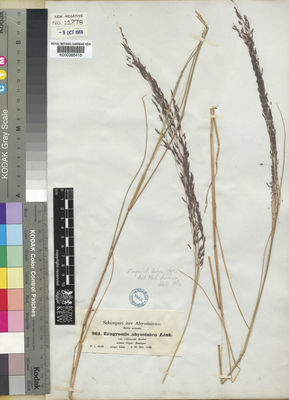 Bogdan, A Revised List of Kenya Grasses p. 18(1958). Eggeling, Ann. list grasses Ug. : 20 (1947). Ciferri in Atti Ist. Bot. Univ. Pavia, ser. 5, 2: 166 (1944). Ciferri & Baldrati, Cereali dell’Africa Italiana II. Teff (1939). Trotter in Bull. Soc. Bot. Ital. 1918: 62 (1918).